Perfo door liners allow tidy and flexible storage for tools, small parts and consumables. Louvre back-panel lining supports a wide range of storage bins, to maximize storage space availability and suit your organizational needs. Reinforced steel housing for heavy-duty industrial environments. The included bins have reinforced sides and stackable design. Manufactured from high density polyethylene, the bins are resistant to -35C/+80C temperatures and most acids, alkalis, greases and oils. Label included. 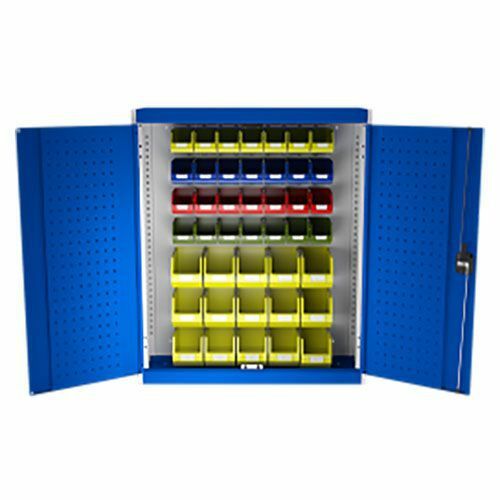 Bott Cubio workshop storage cabinet with perfo doors & 43 bins of different sizes HxW 1000x1050mm. Includes the following bins: x28 bins of HxWxD 83x103x165mm in red, yellow, green and blue with x15 bins of HxWxD 125x145x240mm in yellow, red and green.